Pretoria is the administrative capital of South Africa. The legislative capital is Cape Town and the judicial capital is Bloemfontein. The municipal flag of Pretoria was a simple yellow over red horizontal bi-colour. It was the same as the flags of Prague (Praha), capital of the Czech Republic, and Warsaw (Warszawa), capital of Poland. Red and yellow are the official colours of the city, taken from the municipal arms. There is also an example of a city flag featuring the municipal arms in the canton. However, the unembellished flag was official. 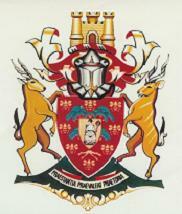 MOTTO: PRAESTANTIA PRAEVALEAT PRAETORIA (May Pretoria be pre-eminent in excellence). South Africa has changed the name of its capital city to Tshwane. As Pretoria is now part of the Tshwane Metropolitan Municipality, its municipal symbols are no longer used.